Arctic is another snow survival film featuring a stranded pilot whose plane has crash landed. Having to battle against the plethora of based-on-true-event films in this genre, cowriters Joe Penna and Ryan Morrison’s fictional tale struggles to match up. The film, directed by Penna, throws viewers immediately into the heart of the protagonist’s fight for survival. 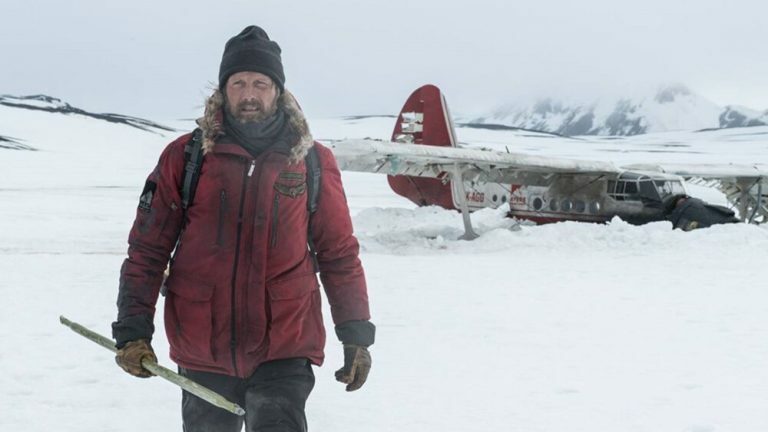 A bearded man wrapped thickly in snow explorer jackets (Mads Mikkelsen) is shown building rock towers to attract attention, trudging through the heavy snow to fishing holes and winding a machine that beeps when aircraft are nearby. Always in the vicinity is the wreck of what is assumed to be his plane, which is luckily intact enough for him to shelter in at night. The passing of time is effectively shown as Mikkelsen’s character – only identified as pilot H Overgård late in the film – repeats these tasks each day over and over again. Eventually, a rescue helicopter appears nearby only to also crash land in the blizzard winds. Overgård hurries to the new wreck and discovers one pilot dead but the other, a woman played by Maria Thelma Smáradóttir, just clinging to life. Inside the helicopter Overgård finds a stove, food and a map, and decides his only hope is to trek the huge distance to a seasonal station. Overgård shows his wealth of survival skills as he adeptly stitches and dresses a stomach wound the woman has sustained, before loading her onto a sled. From this point forward, the film follows Overgård as he drags the woman across the snow for miles on end. While there are many moments of extreme danger, the film is largely slow and predictable. The usual suspects of Arctic survival movies – polar bears, underground caves and crevasses, unsurmountable climbs – all feature. The character of the woman, who is on the verge of death for the entire film, is more a tiresome and frustrating obstacle for Overgård to overcome than a contributing storyline. She is too sick to talk meaning the film significantly lacks dialogue. Minimal speech is fitting given the circumstances but nevertheless prevents the film from exploring its characters and puts a barrier between them and the audience. No backstory is given for Overgård; the reason for his crash is unknown, his full name is unknown, even the location of the film is unknown. With greater background given to the character, his motives would become clearer and it would be easier to appreciate the hardship he is going through. Regardless, Arctic is still a spectacular film to watch. The scenery is stunning and is complimented by excellent make up and costuming (Ragna Fossberg, Tinna Ingimarsdottir and Margrét Einarsdóttir) to show the strain the weather is putting on Overgård’s body. Mikkelsen gives a great performance, doing his best to express his character’s thoughts and emotions through facial expression. Penna has created a very natural film with sparing use of music to allow ragged breathing, heavy footfalls, howling winds and polar bear growls to take centre stage and make viewers feel as though they are also traipsing across the Arctic. Arctic is nothing greater than previous films set in middle-of-nowhere Arctic and Antarctic landscapes but will appeal to anyone who enjoys these stories.